Do you ever have the feeling that you are completely coming apart at the seams? Stitches unraveling and everything falling apart before your very eyes? Towards the last quarter of 2016 I started to feel all over the place. My body would be in one place, but my mind would be somewhere else entirely. I was always juggling too many balls. Rather than focusing on doing each task effectively and successfully, I was trying to do many tasks at one time for the sake of finishing as much as I could in as little time as possible. Not quite a recipe for success. In 2017 I truly want to focus. Period. 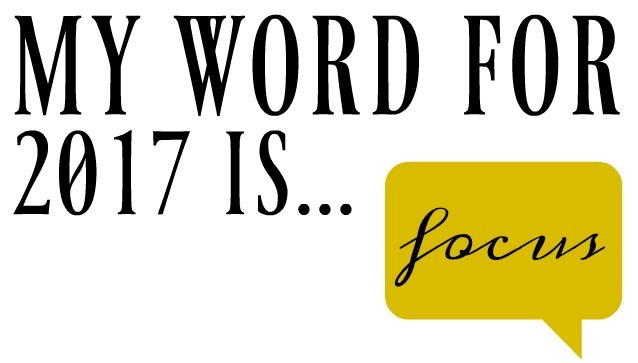 Whether I am sitting at my desk working, spending time with my family, or enjoying an evening with friends, I want to be focused. When I am combing my Inbox each morning, I don't want to be thinking about what I'll make for dinner that evening or who I want to invite to coffee that week. When I'm reading a book before I fall asleep, I don't want to be mentally going through my to-do list for the following day. When I am enjoying dinner with my family, I don't want to be thinking about the mess that will inevitably need to be cleaned up afterwards. I want to stop wasting time and wasting energy. I've become aware of how easily we can fall into the trap of being distracting and wandering away from where we initially wanted to be. When you are focused, you are present. Your mind isn't wandering, it's obvious to those who are with you that you are with them, in mind and body, not somewhere else entirely. When you focus on yourself, it makes focusing on others and the tasks ahead of you so much easier and a lot less overwhelming. That's where I want to be in 2017.